Readers of Dutch IT-channel, platform for IT-professionals and channel partners, have declared SaasNow the winner of ‘Most Disruptive Business Analytics Solution of the year’. This solution is a joint initiative of hosting provider Amsio and SAS Netherlands and enables business professionals to gain insights from their data in a fast and flexible way. 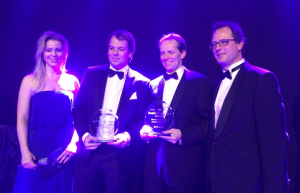 SAS and Amsio were present to receive the award during the Dutch IT-channel Awards Gala event under the watchful eyes of 500 attendees. Gerben van Leeuwen, CEO of Amsio called the award ‘a recognition of strong focus on innovation and the result of an intensive and successful cooperation with SAS Netherlands’. By winning the Dutch IT-channel Award, SAS and Amsio left behind the other nominees in this category; SAP and Aorta Business Intelligence Solutions. SaasNow is distinctive by its flexibility and simplicity. Implementation can be done within a day, it’s easy to extend and it’s based on monthly contracts. SaasNow is currently available in 166 countries worldwide and responses local needs by hosting environments in datacenters within national borders.